Appu Ghar, aka Indira Gandhi Udyan, is an amusement park located near Nidgi in the Pimpri-Chinchwad locality. Development for the park began in 1989, as an entertainment spot for kids – fondly referred to as the ‘Mini Disneyland of Pune’. Now, 20+ years later it is still a go-to for many, with all kinds of rides suitable for both adults and children. 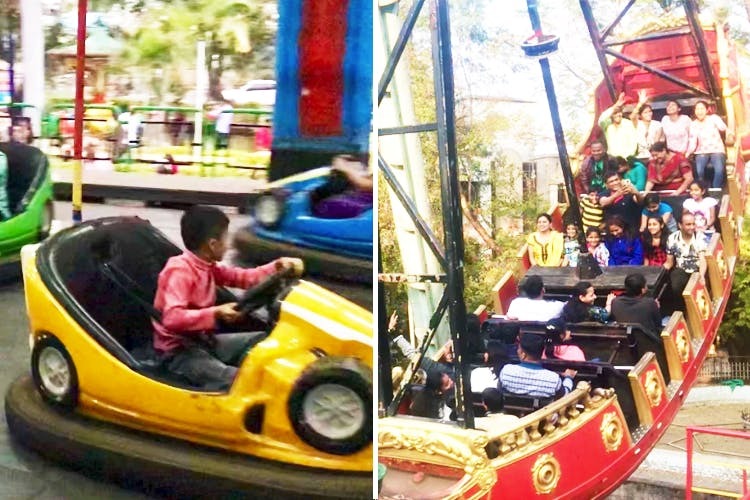 Let out your inner child at Appu Ghar – take a ride in their go-karts, bumper cars, or check out the ‘My Fair Lady’, and super-popular Columbus. Thrillseekers, adrenaline rush via their roller coaster, and ‘Bhoot Bangala’. Entry to the park will cost you INR 50 for adults, and INR 30 for kids – and you’ll have to pay around the same price for each ride within the park. We suggest you go for their more economical ‘discounted packages’, priced at INR 350 for adults and INR 300 for kids – which are inclusive of entry to the park and all rides, except go-karting and food. There’s an eatery on-site serving Indian and Indo-Chinese food for when you get hungry, and we hear there’s a small food canteen outside the park’s main gate as well. Appu Ghar is busiest on weekends, but shouldn’t take you more than 2-3 hours to finish going on all the rides. Though the park remains open all year round, we recommend you call the park ahead of your planned visit, to check for functionality of all rides (sometimes they’re under maintenance). Remember to wear comfortable shoes!